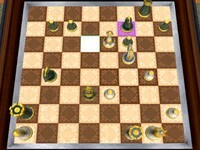 Strategy games require leadership ability of the player, and strategic analysis in determining the best actions and moves that must be made ​​to finish the levels of the game. Lead one of three nations of the Rivadis Empire and takeover your occupied territories. Online strategy game with various type of towers that pop balloons, in lots of missions, levels and maps. Play strategically with defensive towers and mini-tanks made of bubbles. Strategy game with defensive towers and invading tanks made of bubbles. All My Gods - Built a great civilization in the city of the god Jupiter. Bloons Tower Defense - A strategy game in which you stop the balloons to reach to base. Bloons Tower Defense 4 - More levels and new routes in this atractive Tower Defence. Bloons Td4 Expansion - Place strategically towers defense to break the balloons. Catch A Duck - Use your mouse to guide the fox on the road to catch stray birds. Demonic Defense2 - Strengthen and defend the castle from invaders. Doodle God 2 - A creative game where you have to create more than 100 items, using 4 base : Water, Fire, Earth, Air. Farm Frenzy2 - Develop a farm with hens that give you eggs.